We are pleased to announce that the Gallery 1.3 Official Release is now available. Attention PHP-Nuke and PostNuke users! I've released a new version of the random photo block. It's much faster than the old version and should prove to be more reliable. You can find out more about it here. 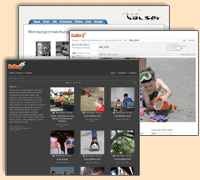 v1.2.3 of Gallery, the popular photo album software, is now available on SourceForge. This release contains a security bugfix and we recommend that you upgrade to it as soon as possible. Gallery is installed on thousands of websites. Install it on yours today!